For all you rum lovers out there, here's a retro cocktail that is a classic from way back. 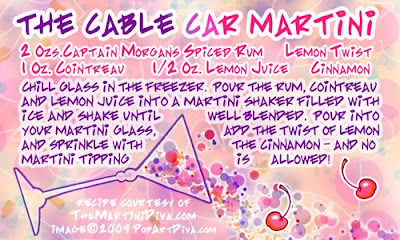 The Cable Car uses Captain Morgan's spiced rum, cointreau, a little lemon and a dash of cinammon. It's a very aromatic and tasty drink that will please those who love their Captain Morgan's! Just remember No Martini Tipping Allowed so don't have too many! CONTACT ME TO BECOME A SPONSOR OF THE MARTINI DIVA!